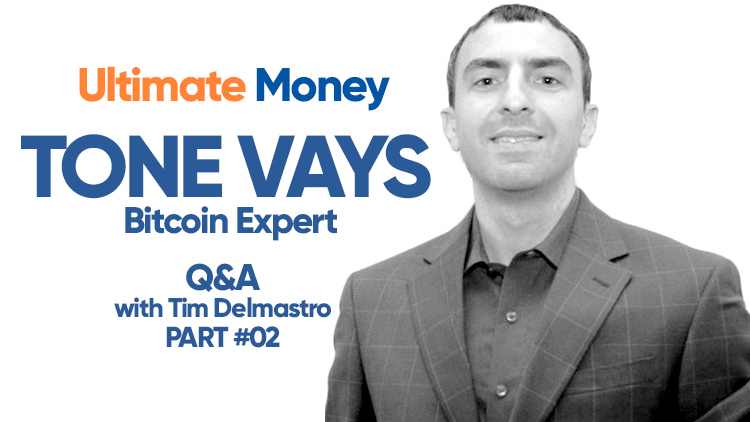 We recently published part 1 of our exclusive interview with Bitcoin expert and Wall Street veteran Tone Vays. In part two of our Q&A, Tone discusses how The Lightning Network will help to scale Bitcoin, as well as his thoughts on Wall Street adopting blockchain technology. Can you give a brief overview of how The Lightning Network works? TV: Imagine we decided to place a Bitcoin bet on a coin flip. Every time it’s heads, I send you a Bitcoin. Every time it’s tails, you send me a Bitcoin. If we did this right now, for every single coin flip, we’re sending each other a Bitcoin payment and it has to be processed by this global network of machines that are using electricity and computational power. But why are we settling this on the Bitcoin Blockchain? Our irrelevant bet is not globally important. But once we have a lightning channel you and I can send Bitcoins to each other all we want, all day long and then when we’re finally tired of flipping this coin, we settle to the Blockchain. So the Bitcoin Lightning Network allows transactions to be settled on the Blockchain at the end of the day instead of every one of these transactions being settled individually, because the world does not need to process each one of these transactions individually. How many transactions can Bitcoin currently do now and how will The Lightning Network improve this in the future? TV: At the moment Bitcoin can settle about four to seven transactions a second, and in the future it will always settle four to seven transactions a second. But each of those four to seven transactions a second can contain a million transactions within it, and that’s what the second layer and Lightning is trying to do. Visa right now settles a few thousand transactions a second, but it doesn’t really settle them because with Visa you can have that transaction reversed two months later. With Bitcoin, it’s impossible to convince everyone to upgrade the software to allow more transactions a second because many people don’t think it’s safe. It also becomes harder for the whole network because if you create more transactions per second, that’s more transactions that need to be validated every ten minutes, and that can lead to centralisation of the processing of those transactions. So it’ll still be four to seven transactions a second but those transactions just need to be more and more important and contain more transactions within them and that’s how you efficiently scale. Blockchain is a buzzword right now. In general terms, what is a blockchain and can anyone create their own blockchain? TV: There’s two things involved in understanding what a blockchain is. A blockchain involves the innovation of Satoshi Nakamoto, which is proof of work – this decentralised mining structure. The majority of the people are using the word “blockchain” and they don’t really care whether it has decentralised mining. When I worked for JP Morgan, we had an internal intranet for internal purposes. That was the intranet, not the Internet, and that’s how I see it when these companies talk about their private blockchains. A private blockchain is like the intranet for that company. It’s only useful for things inside that company and the last thing it needs is its own token of speculative value. What are your thoughts on banks using blockchain technology? TV: I don’t know what they mean by “blockchain technology” and quite honestly, I don’t think they know what it means. They don’t even know that they don’t really need a blockchain. What banks need is a better database to communicate with each other. Banks trust each other, so they don’t need a blockchain. When I send you a payment, you don’t know me so you can’t trust me to make good on that payment. You trust the cash that I give you because you trust that I did not counterfeit it, and the government is making sure that cash is not counterfeit. When it comes to sending you digital money like Bitcoin, you trust the Bitcoin blockchain to make sure that the Bitcoin isn’t counterfeit, and that’s what the Bitcoin Blockchain does. When one bank sends data to another bank, whether it’s a document or whether it’s a value transfer, the banks trust each other, otherwise they wouldn’t do business with each other. So they don’t need a blockchain which is based on users that don’t trust each other. All they actually need is a better database. Another reason they don’t need a blockchain is because with a blockchain, you are responsible for the data, and there’s no reversing transactions. I can accidentally delete all of my Bitcoin and there’s nothing anybody can do about it. Banks don’t want that. A bank doesn’t want to accidentally delete all of its records permanently, or to send a transaction to another bank and have no ability to reverse it. That’s what a blockchain does. There are very few use cases for needing to send a transaction that is irreversible and unchangeable. People say “We can put real estate on a blockchain.” No you can’t! The reason you can’t put real estate on a blockchain is because you don’t want the ability to accidentally delete your ownership of a house. You don’t want to accidentally send the ownership of your real estate to your neighbour with no ability to reverse it. If you don’t want these features, you don’t want a blockchain. It’s there as a bearer instrument on the internet, so whoever owns the private key owns that digital asset. This feature is only applicable in very few cases, but people seem to think that it should be applicable for all cases, and I think that’s very dangerous. Tone Vays features in Tim Delmastro’s documentaries Magic Money: The Bitcoin Revolution and Bitcoin: Beyond The Bubble.